A dozen years — too long — have passed since this page last discussed (in Daruma #12) the diminutive variety of ukiyo-e print known as mameban. A classic example of the Japanese penchant for compactness and portability, this charming format (typically 12 x 8 cm) represented for half a century, beginning in the 1820s, something of a minor specialty of the Osaka publishing world. Mameban (literally "bean prints") boast one-twelfth the surface of a standard 36 x 24 cm ôban print. Nonetheless, these humblest of woodblock prints have succeeded in expanding the legacy of kamigata-e, thanks to their use in genres left unserviced by Osaka ôban — beauties, warriors, sumô, erotica and so on — and to the virtuoso technical finesse they frequently exhibit. Mameban are enormously easy to collect. A good bean print costs on the order of a few tens of dollars — as opposed to one or two thousand for an important ôban — and can of course be counted on to make nearly zero demand on one's storage space. Like diamonds, a collection of a thousand wee examples, should the need arise, could travel all the way around the planet in the pocket of a safari vest. Certain Osaka artist names appear almost exclusively in the Lilliputian world of mameban, and I often fret over how poorly posterity is treating them. Japanese include all mameban, regardless of design originality or printing quality, in the category of "toy prints" (omocha-e), a label that suggests they are unworthy of serious study. In the West, where size doesn't matter so much (in prints), their under-researched state might simply be due to a lack of quantity, and there being no stand-out mameban component in any high-profile collection. 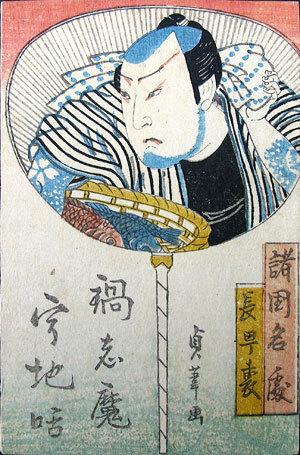 An example of a mameban name that is completely overlooked in ukiyo-e criticism is that of Sada'ashi (n.d.). Though the signature points to a distinguished teacher (think Sadanobu or Sadamasu or perhaps Sadayoshi), and graces numerous fine mameban from the 1840s — mostly warrior and theatrical prints (see Fig. 1) — Sada'ashi exists in no Osaka reference work, and — the true measure of exclusion — can not even be found with Google! Some consolation for the shabby treatment accorded mameban names is that, given the habit of Japanese artists to use a trunkful of seals and signatures over the course of their career, many of the ignored signatures (forget deciphering the itty-bitty, teensy-weensy seals occasionally detectable on bean prints) could easily be pseudonyms for recognized ôban artists who sought to separate the two bodies of work. Additional consolation comes from discoveries like Fig. 2, a potential "bust-out" work by Sada'ashi of the kind that might open the door toward recognition, at least among Osaka print experts. True, the sheet is only 31.0 x 11.5 cm, an obscure variation of the chû-tanzaku format, but the image is large enough to avoid being labelled a toy print, and covers an actual performance at a major (ô-shibai) venue. Depicted by Sadaashi are Onoe Baikô (aka Kikugorô III ,1784-1849, visiting from Edo) as the spirit Usugumo, and Mimasu Tanin (n.d.) as Oe Inabanosuke. From kabuki archives, we also know that the play was titled Umenoharu 53-tsugi, and that it was mounted in 3/1841 at Osaka's Kado Theater. The sheet, alas, offers us no publisher mark, and Sadaashi — perhaps paralyzed at the last minute by the immensity of the space he had been given to work with — neglected to embellish his signature with a gô (nom de plume) or a seal. Thus, we learn nothing new about one of the significant figures in mameban production other than that — and this doesn't amount to a hill of beans — at least once in his career he broke free of the restraints of his Tom Thumb corner of the print world and got a taste of bigger things. This article originally appeared in Daruma, no. 62, Spring 2009. Copyrighted © text and pictures reprinted with permission.